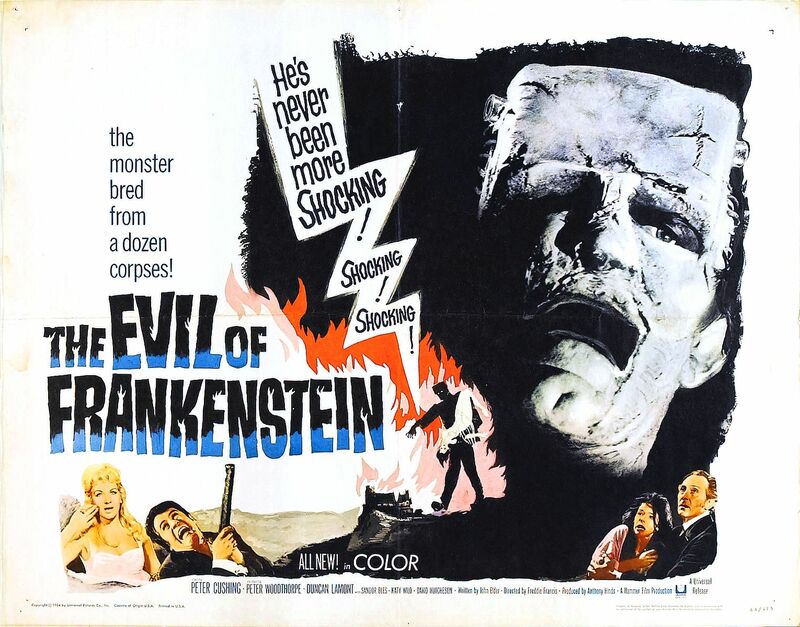 The Evil of Frankenstein (1964) is a reboot with aesthetics more in line with the Universal series than either of its predecessors. Frankenstein is driven from another town and decides to return to his roots. Once back home he encounters the men who drove him out and finds his first creation. The brain is damaged, so Victor repairs it. Unfortunately the Monster still won't respond. Victor supposes that the hypnotist Zoltan can help them revive it. But the nefarious Zoltan has his own plans for the Monster. Hypnotism heals brains... I think this is a new low for Frankenstein brain issues. Apparently after a brain is surgically healed, it needs a hypnotic jump start to get it up and running. Hans acts as Victor's conscience and seeks to temper the raging Victor. Ultimately, though, he does very little and mostly just tells Victor when its time to go. The Mute Deaf Girl is cute and forms our empathetic bond to the film. She is here so we care what happens to someone and reflect the innocence of the monster. I was really waiting for her to do more, but she is just here to look pretty and be a prop to push the characters of her male counterparts. Burgomaster and Captain of the Guard are lecherous old men who drove the Baron and Zoltan from town. They ham it up as well and give the mob a nice pair of despicable leaders. Baron Victor Frankenstein is out of control in this movie. A seething and frustrated man who wants to see his theories proved, but is constantly stifled by religious intolerance. Cushing puts in an amazing over the top performance here. It is hilarious.That said, it really does seem all he cares about is the science and constant interfereances have pushed him over the top. The Monster is once again a pawn, but this time it isn't even Victor's pawn. It looks silly and you just count down to its rampage. Professor Zoltan is a manipulative hypnotist. He gains control of the Monster and uses him to gain wealth and exact revenge on his enemies. I was really disappointed in him. He had a paper thin story and just kind of ran amok. 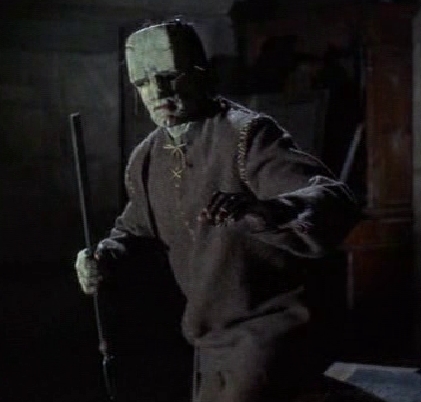 I almost would have preferred a straight up retelling of Universal's Frankenstein than having him in this movie. Why didn't Hammer just let Victor be a vengeful psychopath, it would have been a lot more fun. The sets look far better and have a lot more space and are more in line with the Universal series. The first two Hammer Frankenstein films were very claustrophobic, but this one gives us sweeping mountains and a huge lab. Contrasting with the lush sets is the cheap makeup used for the monster. It looks like a bad plaster copy of the Universal Frankenstein. It ends about how you'd expect. Nothing special. It wasn't good, but at leasi it wasn't as boring as The Revenge of Frankenstein. I really wish it had been a continuation though, since it seemed like Victor had really gotten himself together at the end. Instead we get a pretty Universal retread once again held together by Peter Cushing. I'd let this one pass you by. 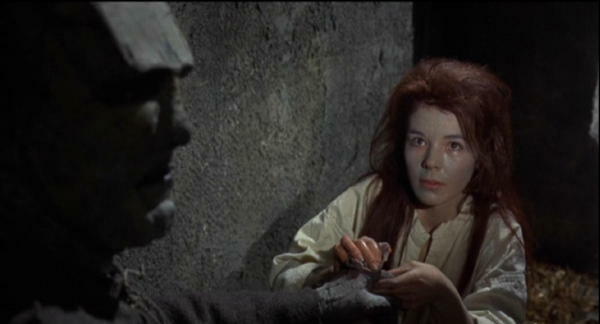 Frankenstein Created Woman (1967) takes the Baron out of his tired repeated role and gives him an interesting new purpose. Oh and we've rebooted again, for the better this time. We open on a drunkard being lead to the chopping block. He spots his son in the distance and has the priest chase him off, but his son, Hans, returns and sees his father lose his head. We cut to the son grown up staring at the gallows before running to help Doctor Hertz pull a body out of a freezer. They revive the body and we discover it is Baron Frankenstein working on an experiment involving the soul's relationship to the body. To celebrate their success they send Hans to retrieve some champagne where he meets a crippled and deformed girl, Christina, who he loves. Her father returns and he clearly doesn't approve. Three local ruffians come in and start picking on Christina. Hans beats the three of them up and when the father stops him, Hans threatens to kill Christina's father. But what happens when her father ends up dead and the locals point to the murderer's son? And how does Frankenstein's experiment relate to all this? Sorry for the long recap, but I loved this movie. Maybe it is because I've just gone through The Wolf Man 1941 (Decent), Frankenstein versus the Wolf Man (Meh), The Curse of Frankenstein (Decent), The Revenge of Frankenstein (Boring), and above The Evil of Frankenstein (Meh) that I was was really surprised by this film. Characters I care about? A plot that involves more than Victor makes Monster, Monster goes on rampage? Romance, Tragedy and Revenge? This movie has all this and Peter Cushing on his A game. The sins of the father condemning the son are Hans' theme in the movie. They hint at the idea of hereditary evil, but don't delve too deeply. The idea of capturing a soul and the soul's relationship to the body are the main idea for Victor and Hertz in this movie. They explore it a little, but it largely ends up as a bit of silly pseudoscience. Some shots of Victor and Hertz creating the machine toward the beginning don't make a lot of sense until later, but do provide some important bonding time for the pair. Hans is a caring, intelligent young man with a temper. He lets his passions sweep him into a frenzy and he doesn't play by the rules. This naturally leads him into some trouble. While Hans isn't the best acted, he certainly brings vitality to the piece. His fight scene with the three jerks is organic and you can feel the sloppy nature of a bar brawl. When Hans and Christina talk about their fathers it is really touching. Christina is a scarred cripple whose father spends all his money on trying to cure her deformity. Her father is ashamed of her and doesn't approve of her love for Hans. Christina is torn by her devotion to her father and her passion for Hans. I really felt for her character through this story. It is really more her and Hans' story with Victor as a major side character. I feel that this is one of the reasons why it works. Doctor Hertz is the town doctor and acts as a a compassionate counterpoint to Victor's severity. He is a bit of a bumbling country doctor stereotype, but he does have a few scenes. One where he slyly talks a constable into giving him a body felt very right for giving him an edge of surprise. I also loved the fatherly relationship he develops for the Creature. "Bodies are easy to come by, souls are not!" Baron Victor Frankenstein finally makes it to a Hammer hero section! This is my favorite incarnation of the character I've seen so far. I was amazed at how much he was able to do, having to share the screen with so many other characters. Victor begins as a manipulative, callous and dismissive workaholic and manages to progress to stern yet caring scientist. He also has several movie stealing scenes. The scene where he extorts money from the three jerks is hilarious. Also, his cool dismissivness at the trial is superb. Everyone is wasting his time and he does not care for it. The Mob are a driving point to the plot and back to their prejudicial roots. Anton, Johann, and Karl are the three jerks who create all of the drama in this story. They're little more than rich boy bullies, but they have a surprising vicious streak. Later they do show some remorse and fear at some of the crimes they commit. They are a great example of power corrupting. I was counting down the minutes for their comeuppance. And they deserved worse. The Creature, yes I know those of you who have seen this film are about to protest, but I'm trying to go spoiler light on this one. The Creature is fantastic, almost back to the calculating vengeful creature of the novel but with a great twist. There is no rampage, just cold, calculated, creepy revenge. The location shooting is great. We enough of a town that we believe it all exists. They make good use of simple, but believable sets. Also I really enjoyed the shots in this movie. Victor's entrance in the coffin was perfect. The use of the guillotine and how it reflects the separation of the body and soul. The kills are simple, but effective and creepy. They gradually build until the bursting point at the end. The film shifts tone in the last thirty minutes and manages to both stay true to past Frankenstein endings and be a departure at the same time. The ending is unlike any of the other Frankenstein films I've seen. Peter Cushing delivers a pitch perfect performance. It is tragic yet fantastic. Yes, I know you can see the score. I also know that any Universal fans might cry foul on a Hammer Frankenstein film even being given a comparable score to any of the first three Universal Frankenstein movies, but I really enjoyed this one. It has its own take on the Frankenstein story, manages to give all the characters agency and purpose, and Victor is just remarkable. There is a lot of silliness and some stereotypes, but I believe they are negligible. 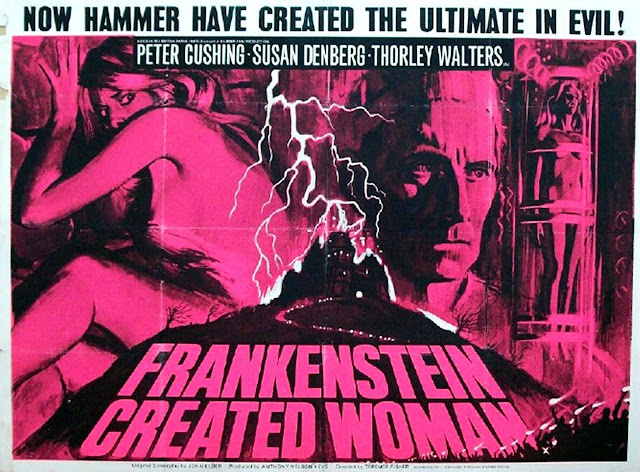 If you only see one of Hammer's Frankenstein movies, make it this one! Sadly, the DVD release is out of print and somewhat difficult to get right now, but they are remastering the Hammer Horror releases starting this year, so hopefully we shall get a proper release soon!